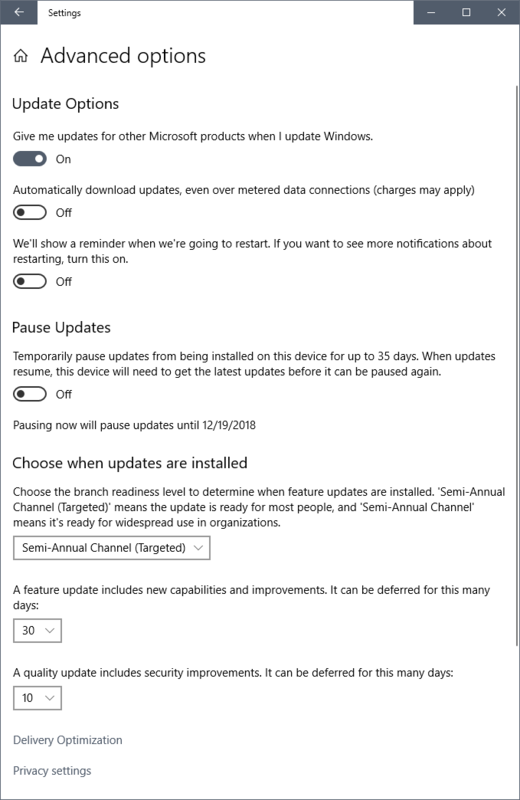 Put auto update on pause after hearing about potential issues with 1809 - just took the pause off and was pleasantly surprised - the available updates were : (1) Definition update for Defender (2) Cumulative 1803 Update (3) Malicious Software Removal Tool and (4) Adobe Flash Player for W10 Version 1803 . I am still deploying 1803. We will roll it out to about 40 machines. Once I get some run time with 1809 in a virtual machine I'll consider upgrading. November update is just around the corner. I have been on ver 1803 since it came out and the auto update has not forced 1809 on my PC yet. Will see. My desktop is still at 1709. Not sure if I can get to 1803 once 1809 is out so I may need to wait to see how 1809 fares. I can hold off another six months or so to let the rest of the world test it out. Eventually, I think they stop issuing updates for 1709 though. This is for FYI only. I have several laptops and desktops so when MS first released Win10 1809, I downloaded it and installed it on several machines. Later on, there are several complaints about missing files, particularly if you use Outlook mail and/or OneDrive. I just want to share that 1809 since stopped by MS has been real stable on many of my machines. I do not use either Outlook and only OneDrive for storage. It is running on my Surface Pro 4. I like the SP4...it's more of a "computer" than my iPadPro 10.5". They both are good machines for what they are intended for. 1803 basically killed an old laptop I was using for playing DVD and mp4 videos to a TV. Tried everything I could think of for months, would never complete and ate so much performance it was unusable. Clean restore to W7 without network just has the occasional "please activate/update me" nags. And I have a built-in DVD player! OT, now, anyone want to talk about the joys of owning two perfectly HW-functional and slowly SW-nonfunctional iPad 3s? I D/L'd 1809 when first released, no problems and very stable. Today it was updated to 1809 17763.134 . Same here--I assume. I didn't check the update number but still on 1809. I paused the auto update as suggested here by marking our WiFi as "metered". So I haven't clicked to download the update today YET. How long did it take before for the problems to become known. ...The problem, as the most recent incident painfully illustrated, is that even as overall quality has improved, low-volume, high-impact bugs managed to evade detection. And although the number of people affected by the Known Folder Redirection bug was only in the hundreds, the impact on the public perception of Windows quality was devastating. Some of the posts in the comments section demonstrates just how frustrated some are. Yesterday it was announced that the original issues with 1809 have been resolved but advised that users still wait for the auto update from Microsoft . Wait for the "auto update" versus what? Under update settings -> advanced I set feature updates to be deferred for 30 days and quality updates to be deferred for 10, it's been pretty good at avoiding broken patch Tuesdays. Should it be near the "Update options" such as where one can select "metered data connection"? It's under advanced options, but it might be Pro/Enterprise only. Yeah, that's where I looked. I'm not seeing that particular choice. I also tried looking in a few other places, but couldn't find it. Well, I've got it delayed for a bit... probably until the next restart. For others, apparently it's just the pause by declaring the connection "metered". You can update Defender independently of the OS updates. and then click the button that says "Open Windows Defender Security Center"
I'm not finding a separate "Windows Defender" section, and Cortana just brings me to the main "Security" start. Might this also be for the more advanced Windows versions, as mentioned above? There's no need to hunt around for Win10 options the search feature works well (finally only took 7 versions). Click on your windows button and just start typing "Windows Updates" you'll have several options "check for updates" will get you into your update options. I tried updating a couple of systems a few days ago, and still on 1803. Read something about 1809 having problems and still on hold, so glad it hasn't updated and caused problems. There wasn't anything I needed in the update that I absolutely needed, so I can wait a bit. As far as the iPad 3, it's probably similar to my iPad mini 1 and iPad 2 (which I recently traded in) and some older iPhones. They still work more or less (the phones less from all the abuse). Regular surfing is too slow now at most sites, so only for cooking and looking up recipes. Watching videos isn't bad once you get started and some video apps are still ok. I jailbroke the iPad 2 and ran some unapproved apps before I got rid of it, and these older systems might be fun to hack. Still, they're beyond their prime, so only best at their original uses. I've used one to take time lapse videos to document things like battery charge and discharge times, basically using it as a video recorder. It's hit or miss, mostly misses these days, but they don't have a ton of value. You might get a few bucks trading it in, but it hasn't been worth the trouble for me to eBay them and pay all the fees and send it out for $20 left over if I'm lucky. And it includes the main system update ("Cumulative Update...") along with several Updates for Defender Antivirus, and one for Adobe. I still cannot find a way to update all EXCEPT the main Version 1809 Cumulative Update. I am using Windows 10 Pro; it may be that some of the flexibility described in various posts is not available in the Home version. That's what seemed to be the situation. But brad.clarkston suggested looking a different way, but that just got me to where I already was, with a single click from what I already had tacked to the toolbar. I guess there's no way around the full Windows 1809 update if I want to update the virus protections, and I do want that!. Some "experts" are suggesting just waiting a couple of days to see if there are reports of truly serious problems like last time. I've just backed up all files... keeping fingers crossed.. It may well be that Defender isn't running every day. Mine only does a scan once a week, I think. I'd have to check the settings. In any cases, probably the most you would miss is the most current additions to their virus definition file. So the vast majority of the active viruses out there are probably already in the definition file that you already have. With a reasonable amount of good computing hygiene you are probably fine. It's those latest versions of anti-virus software that I most want from any new downloads, not new Windows "features" (assuming that the stand-alone antivirus updates are more up to date). It's the "latest and greatest" of the virus variants that worry me. I do scans more frequently, but the software can't "get" what it "doesn't yet know about". This may sound very low tech, but I don’t turn on my Win 10 machine during the week of patch Tuesday. It is doable because I have iPads to do all the online stuff. Obviously, problems can linger, but at least I try. It does seem to work to put the update on "don't use during a metered connection", and declare your regular connection to be "metered". The full update went well (and fast). But upon firing up again, I did (almost automatically) check for "updates" for Defender. And there was a HUGE one, 5+ MB to download. Usually they are well under 1MB, such as .26MB or .51MB, and only once recently did I notice one barely above 1MB. Given that I had just done the *full* update, including Windows, antivirus, and one for Adobe showed up... why was there such a large update "ready to go" immediately after the full download? Had the system *only* downloaded the stuff that was queued from a couple of days ago, ignoring all updates since then? 5 MB isnt' that big. The smaller updates are definition updates, which aren't huge. It's likely that the 5 MB one is an update to Windows Defender itself, separate from the definition files. You would think that would've been rolled into the larger Windows 10 1809 update, but that has been held up for over a month because of various issues. Microsoft probably didn't go back and make sure every component like Defender was up-to-the-minute. Actually, I think it was just the definition file. I just updated two VMs and they had the same larger-than-normal definition file. No AV product is going to protect you from a true 0-day bug/virus/whatever that's not how they work no matter how many big "holistic"- words they throw at you. Layer 1: Win10 Pro Defender AV (free) + Malwarebytes (paid version). Layer 2: Firefox/Chrome + uBLock Origin extension with added filters + HTTPS Everywhere extension + a good password manger extension. The second layer is the beater protection. Starting literally yesterday, my Win 10 laptop is occasionally dropping its WIFI connection to my router. Happened 2x yesterday. Just happened again 10 mins ago. Can't recall the solution. Anyone else seeing this occurring? Items like this typically correlate w/ some Windows updates that change hardware settings, have been there before. This happened on my old laptop years back (Win 8) and it took hours of scouring the internet to 'find' the solution. Uninstalled the network card and rebooted (so it would reinstall), hope this 'cures' it. Any further input appreciated. Router is nearly new (I have pure fiber), and isn't the issue. As stated laptop is nearly new too (yearish old). Edit to add: I had some Lenovo 'Vantage' software start popping up on my desktop just this week, unclear what it is/was or why it suddenly appeared. I uninstalled it. Wondering if this correlates. Will never buy a Lenovo again. realized that last year after purchasing this device. Thats another thread of course . Last edited by F150HD on Sat Nov 24, 2018 10:47 am, edited 1 time in total. We've had this happen on occasion, and it seem to run in 'trends', so to speak. For a while it happens, then it doesn't, for much longer. We've tried re-setting the router, and that seems to help. Sometimes.